Viajar do Aeroporto Internacional de São Francisco (SFO) para sua residência particular pode ser complicado, mas não precisa ser. Essa opção conveniente tira todo o inconveniente de alugar um carro ou pagar por um táxi depois de um vôo. Basta digitar seus dados ao fazer a reserva e sua transferência compartilhada será confirmada instantaneamente. Quando você pousar, mostre seu voucher para o motorista e pule dentro do veículo. O serviço está disponível 24 horas por dia, sete dias por semana, por isso não importa quando o seu voo chegar. Por favor, note: O preço exibido é baseado em passageiros adicionais reservados. Taxas de passageiros individuais diferem, por favor consulte o calendário de preços. Esta transferência é válida dentro dos limites da cidade de São Francisco apenas. We only had to wait at the airport about 10 minutes before the shuttle arrived. 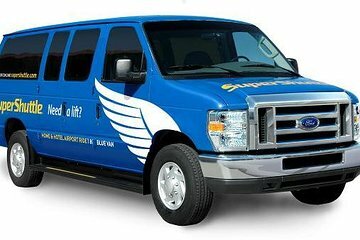 Look for the shuttle personnel not the airport personnel. We had two airport personnel send us in two different directions. The public transportation to our location, near Presidio Park, would be cheaper, but a nightmare of connections, and the shared ride was less than 1/2 the cost of other alternatives. We were the 2nd ones dropped off and it most likely only took an extra 15 minutes instead of a direct drop off. I'll take the extra 15 minutes to save the 40 again. I had to wait three shuttles: after two flights and a 24 travel a it difficult but everything went smoothly. I was disappointed with this last year just to forgot to ring you back to complain, I book this transport from San Francisco to my Cousin house I paid on line but driver told us that I have to pay more because it was not the right amount. I was shocked because we paid what was said online he did not even give me a receipt. So I would advice to be aware of this that it could happened to anybody as well. Good service: a SuperShuttle agent met us outside the gate at the airport to check-in, telling us the time and the van number to board. The ride is comfortable. My sugestion is having driver giving us an approximate time for the ride. The driver had no idea where he was going and got frustrated. He passed the place where I was staying and didn't want to drive around another time so dropped me off a 1/2 block from my place. I wouldn't have cared too much had I not had a 2 suitcases on me. I was close to the last stop on the drop off route for a full minivan, but it was a very pleasant way to get to the apartment where I was staying. I got to see a bit of the city and even met a local returning home from a trip who kindly provided a narrative of what I was seeing and the layout of the city as we drove around. Dropped me directly in front of my apt. Would not recommend if you need to be at a spot by a set time which I did not as the routes are determined by how many people are on the ride and where they are going, so, time variable arrival. Waited at Airport for 40min or so till we get a ride. The person who helped us at the Airport keep telling us that the driver is on his way and just 5min away. Since then we waited 40minutes and about 30min in we asked the guy at the airport if the driver doesn't show up we would rather take cab at this point and he told me he won't work for Supershuttle and all he can do is call the Supershuttle Driver and check in with the driver. He said the driver still telling him he's on his way and 5min away. Really bad experience especially when we are tired from International Travel.